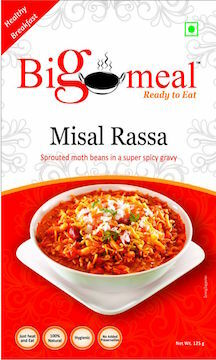 Bigmeal Ready to eat Misal Rassa in its real way the Kolhapuri cuisine is full of mouth watering delight. It is a mixture of Sprouted moth beans, Potato and Super spicy gravy, traditionally eaten with Farsan, chopped onion , coriander and served with bread and lemon wedges. It is a nice tummy filler and can be a whole meal in itself.